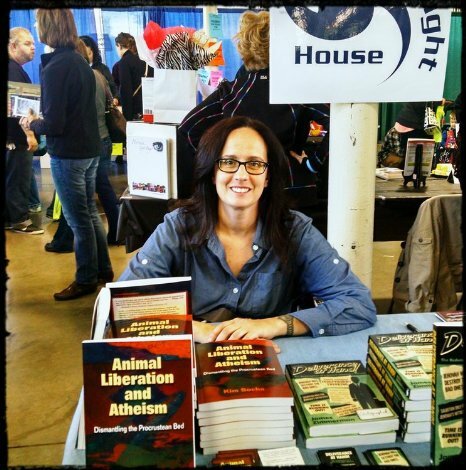 Kim Socha promoting her book ‘Animal Liberation and Atheism’, which she discusses on this episode. Listen to this episode and subscribe to our podcast on iTunes. You can also listen to this episode on Stitcher, Cyber Ears or download it on Archive.org (73mins, 31MB). On this episode Nick is joined by Kim Socha, who is an English professor, grassroots animal liberation activist and author of the book ‘Animal Liberation and Atheism: Dismantling the Procrustean Bed’. We discuss this book, religion being a conservative human construct, the animal movement being nearly totally godless, right-wing people engaging in more animal exploitation and meat consumption, critiques of an article on an “inclusive” animal movement, atheists such as Richard Dawkins and Sam Harris criticising speciesism but not going vegan, challenging the idea of “humane” slaughter (which is about the best animals can hope for from most religious texts), food deserts making it difficult for some people to live vegan, and child labour and slavery in the production of cocoa. We encourage people to check out Kim’s book on atheism and animals and like the Facebook page for it! In addition to the discussion with Kim, Nick also discusses the greyhound racing industry, links with Marius the giraffe being killed at Copenhagen Zoo last year, and a correction on the queer refugee whose letter we read on episode 85. This episode is brought to you by “Anarchist Aaron”. You can hear Aaron on episode 85 discussing queer refugees. Thanks a lot to Aaron for becoming a member of our show – you can become a member and sponsor an episode too. Gogol Bordello ‘Supertheory of Supereverything’, Sue-Anne Post ‘Twenty Years of Kicking God in the Shins’ – from the 2010 Atheist Convention, ‘I Believe’ from the Book of Mormon, Nick’s discussion with Kim Socha – part 1, Nick’s discussion with Kim Socha – part 2, NOFX ‘You’re Wrong’, NOFX ‘You’re Wrong’ (live). You can listen to a short (8 minute) version of this episode, which features a shortened version of Nick’s discussion with Kim Socha on atheism and animals, below. You can subscribe to these short versions of our episodes through Omny.